WHERE YOU GET TO DRIVE A REAL DUNE BUGGY! AS SEEN ON OVER 50 TV SHOWS AROUND THE WORLD! 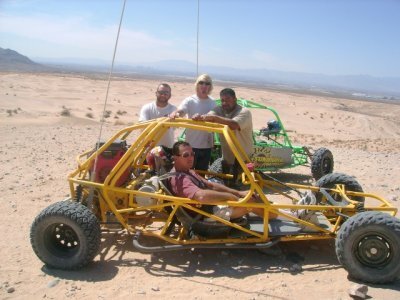 Don't be duped by wanna-bees, the best Las Vegas off road adventure tour experience is at SunBuggy! With the best record in the off road ATV tour and Dune Buggy rental industry for 10+ years running and the happiest customers anywhere, SunBuggy is the worlds most amazing off road adventure tour company! Life is complicated enough without people doubling their prices so they can quote you 50% off deals! When you look at our options you'll notice that we post the prices, this is because we don't play pricing games all over the net on 'Deal Sites' to build pretend value. Other than some off peak or repeat client discounts, at Sunbuggy the fact that you're driving a special purpose handbuilt high desert thrill machine is our "SPECIAL", it costs what it costs and it's worth every penny! When we tell you about a tour time, we don't count the time you spend in our free shuttle coming from and going back to your resort, to us that's not the fun part. Most of places who post those "Specials" consider that a part of your tour time, we just think you're smarter than that. Beyond counting a BUS RIDE as a part of your tour, if you're counting 'laps', ask how long one lap takes and do the math. SUNBUGGY is an amazing value once you actually break through all the double talk and figure out how long you get to drive. Our rental fleet has the widest selection of ATVs, Polaris RZRs, 3/4 Scale Desert Racers, and of course Dune Buggies that seat 1, 2, or 4 people! There's something just your speed at SunBuggy - you can rent an ATV and go explore on your own, take a leisurely off road tour with an experienced guide, or go beyond your typical off road tour and engage in a high speed chase. AMAZING CORPORATE EVENTS FOR GROUPS AS LARGE AS 1,000 PEOPLE! 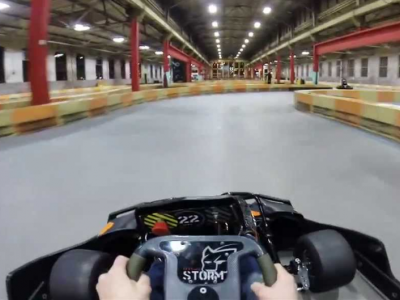 Just imagine you and your co-workers engaged an afternoon or evening of Dune Buggy Racing! Suitable for ages 4 to 104, our vehicles can seat anywhere from just 1 person all the way up to 6 seat Family Buggies! With the shared expereince of a SUNBUGGY CORPORATE EVENT it's Teambuilding at a whole new level! Beyond just the best vehicles, locations, service, and prices, our staff loves what we do and it shows! Real full time employees, not part time sub-contractors means you deal with full time professionals! Our employees love it here and as such you're certain to feel welcomed! Convenient online booking that's secure and even mobile friendly (book on a tablet or smartphone! ), or just call us and a live person is ready to help - 24 HOURS A DAY! You won't find better value than you do at SunBuggy, if anyone is claiming lower prices you're just not getting a comparable experience! "Todays Special Offers for Las Vegas Tours Current as of 4/20/2019"
To get these deals you need to CALL us to book, which is easy because we answer the phones 24 hours a day! WE DO NOT CONSIDER YOUR FREE ROUND TRIP SHUTTLE RIDE A PART OF YOUR "X HOUR TOUR" MANY OTHER VENDORS DO! - ALSO - THERE ARE NO FAKE OVER INFLATED PRICES AND MASSIVE FAKE DISCOUNTS HERE, JUST REAL DEALS WITH THE BEST OFF ROAD ADVENTURE COMPANY IN THE KNOWN UNIVERSE!!! ATV OR DUNE BUGGY? DO BOTH AND SAVE $40 PER PERSON! SunBuggy offersr both an ATV TOUR and a DUNE BUGGY CHASE experience, do a TOUR THEN CHASE COMBO and save $40 per person!!! you may either do 30 minutes of each or 60 minutes of each. while we have always provided FREE shuttle service with all of our adventures, our Las Vegas location now has PRIVATE VIP LIMO SERVICE available as an upgrade option, just ask when you call to book and we can make arrangements for your group to have a Private Limousine from the Las Vegas Strip to our Speedway Location and back! 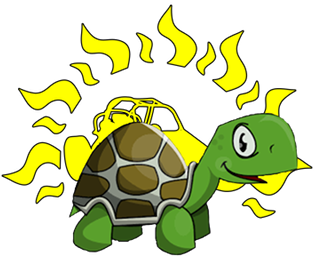 - NO WAITING - your Limo will be on standby during you adventure ready to run when you are! 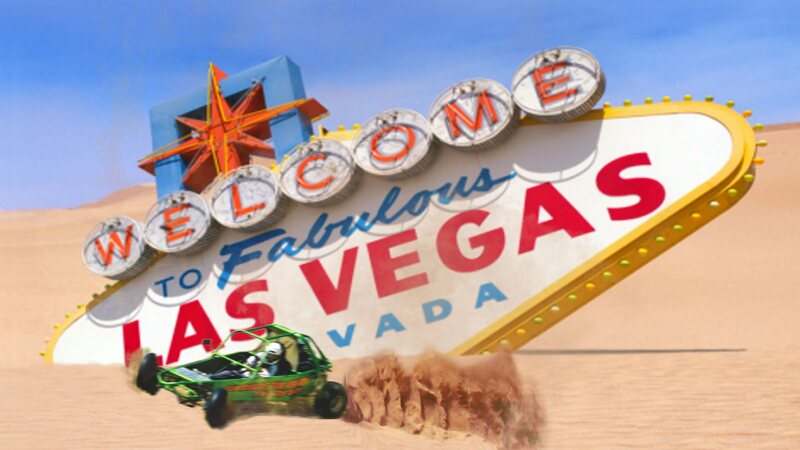 This is the Las Vegas Off Road Dune Buggy Desert Race Driving CHASE EXPERIENCE everyone talks about (as seen on TV ALL OVER THE WORLD!) DRIVE LIKE YOU'RE TRYING TO GET AWAY WITH SOMETHING! The Primary Reason you're driving a SunBuggy desert racer is that no plain off-the-shelf vehicle could last 5 minutes on this insanely fun course! 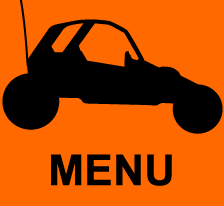 Don't be duped by tours with plain store bought UTV's, Off Road Golf Carts can't traverse grades over 15% (read the dashboard warnings). Our Most Popular Las Vegas Off-Road run - a wild desert chase on 15,000 acres with the Las Vegas Strip in view from the tops of the dunes! Note that this is more than an Off-Road TOUR, rather a full on Off-Road CHASE! Easily the most intense driving experience available anywhere, the Famous Mini Baja Chase at NIGHT! 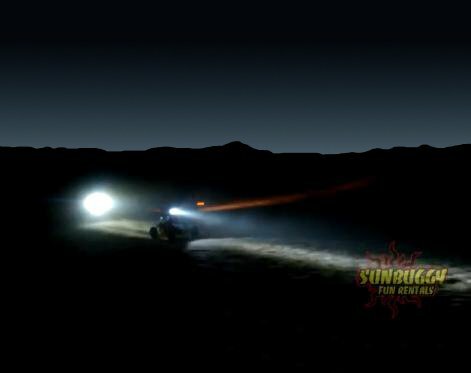 Running off road after dark is an otherworldly experience - Welcome to Planet SunBuggy! Before you launch into the Las Vegas Nightlife, kickstart your senses with this MIND BENDING DRIVING EXPERIENCE - The VEGAS MINI BAJA NIGHT CHASE! 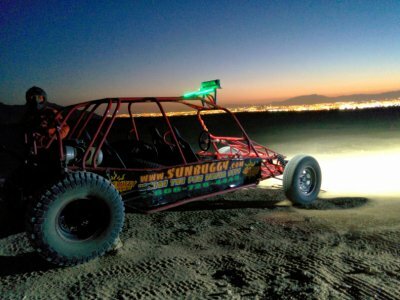 By popular demand SunBuggy is offering our Mini Baja Chase off-road experience at night! This very memorable once in a life time experience is the perfect way to set your Vegas Night off, particular if you've been subjected to conventions, meetings, and seminars during your daytime. Start your night with the heart pounding thrill of a high intensity chase in the dark desert overlooking the Las Vegas Strip! You will bypass the lines at Club SunBuggy - your VIP Club Pass at this Vegas Ultralounge Sand Covered Nightlife Playground is all inclusive! Take the kids out for a family Dune Buggy ride! Mom! Dad! Bring the Kids on an adventure that'll never be forgotten in specially designed family buggies! 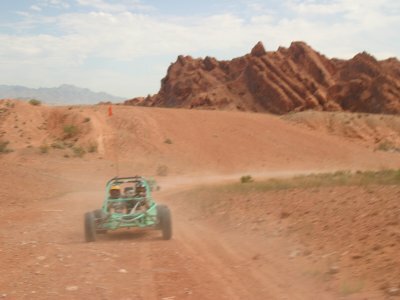 The Las Vegas Family Fun Romp is 60 minutes of thrilling Off Road Driving that you're sure to NEVER FORGET! We make this available so you can group with families and minimize mingling with other non-kid toting patrons. 1 seat, 2 seat and 4 seat dune buggies available! Dune Buggy, ATV, or UTV your way through this majestic state park! 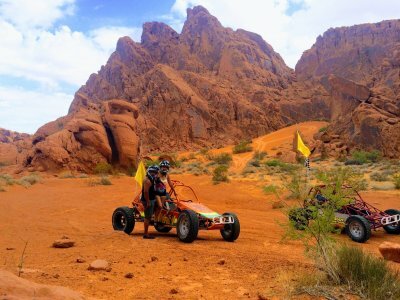 A Sedate and Scenic nature tour, SunBuggy is the only vendor permitted by both the Parks Department and the BLM to go right into Valley of Fire State Park! Recently featured in National Geographic Magazine, this is a Las Vegas VIP Tour Expereince on a whole new level! This beautiful ride through varied desert terrain and bright red sand dunes is popular with honeymooners, nature buffs, and photographers for the great out of this world pictures you'll get. As this is a casual paced scenic ride we offer the option of an ATV Tour, a UTV Tour, or SunBuggy Dune Buggy Tour. OUR VIP ATVS are Big and COMFORTABLE FULL SIZE ADULT ATVS! They are 450cc 4x4 fully automatic quads so there's NO SHIFTING to worry about! This is an all day experience! The Vegas Dunes Off Road Tour allows those who wish to experience the magic of Off-Road driving on the sand dunes a chance to take the wheel and see what it's all about. The same area as our MIni Baja Chase just 15 minutes off the strip, however this is a casually paced Las Vegas Tour experience where you're following a tour guide as they meander through the dunes. Available in 30 minute 1/4 tour or 60 minute 1/2 tour durations. Smaller groups, Diverse Locations, Seasoned Guides, and Full adult sized ATVs make for the Best ATV Tours in Las Vegas! 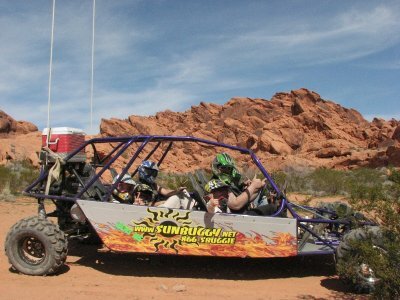 Sun Buggy is your Las Vegas Off Road ATV Tour Expert! We have a fleet of ATVs for rent that are all top name brand quads! FULL SIZE ADULT ATVS! They are 350cc fully automatic quads so there's NO SHIFTING to worry about! 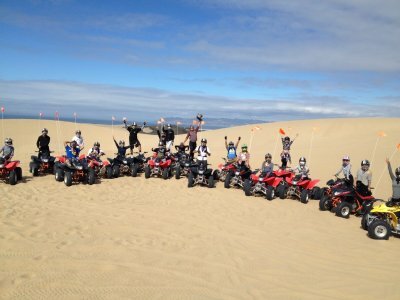 The ATV Tours and ATV rentals are not to be confused with our Dune Buggy experinces. While our Dune buggy experiences have been featured on over 40 television shows from around the world, many don't realize that we also have a very well maintained fleet of over 300 ATVs! 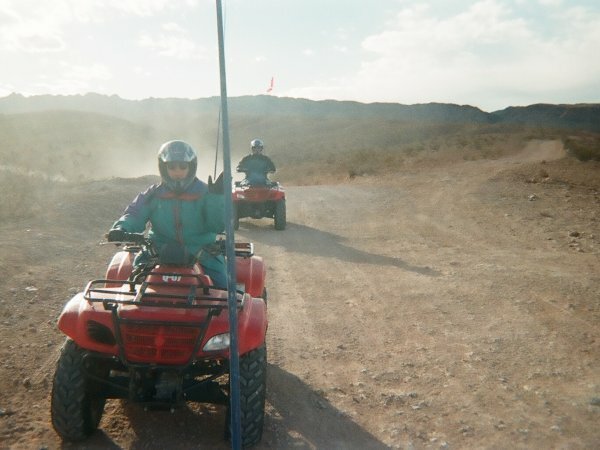 We've been around for a long time making happy memories for thousands of clients, so for either an ATV or a Buggy it just doesn't get any more legit than a SunBuggy Las Vegas Off Road experience. As ATVs are different vehicles we have special experiences designed specifically for ATVs. There are currently 3 different types of ATV off road experiences we're offering from our Las Vegas Location. Click for More Info on your ATV Options at SunBuggy Las Vegas. This All Inclusive Package includes a shuttle from and back to your resort, a full 75 minute ATV ride (We don't count the time you spend in the shuttle and getting ready as a part of your tour, but if we did this would be a 3 hour tour!) plus a Free Las Vegas SunBuggy T-shirt, gloves, and bandana to take home with you as a reminder that you Did the Dunes in Las Vegas! FULL SIZE ADULT ATVS! They are 350cc fully automatic quads so there's NO SHIFTING to worry about! This is hands down the best deal going for an ATV tour! 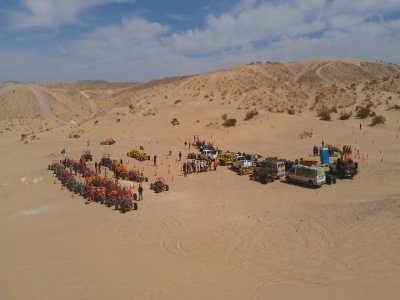 Vegas Dunes ATV Tour 30 & 60 min. Smaller groups and Full sized 'Grown Up' ATVs make for the Best Value ATV Tours in Las Vegas! FULL SIZE ADULT ATVS! They are 350cc fully automatic quads so there's NO SHIFTING to worry about! Come for a ride at the Vegas Dunes, only 15 minutes from the strip! This is an ATV ONLY tour, Because ATVs are not as forgiving as our Sun Buggy Desert Racers, you MUST BE OVER 18! 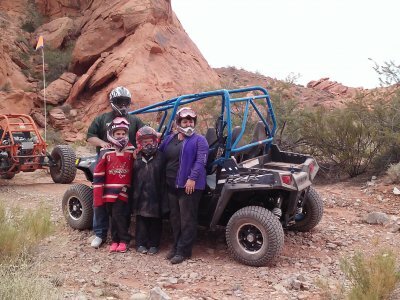 Scenic ATV Tour at Valley of Fire followed by a Frantic Buggy Chase at Vegas Dunes Combination Package! This gives you 2 very different vehicles at 2 very different locations. An ALL DAY EVENT you'll be driving an ATV for a 3 hour guided Off Road tour at the serene and scenic Valley of Fire State Park, taking a lunch break with made to order sub sandwiches at Sub Shop in Logandale, and then doing a high intensity 60 minute Off Road chase driving a Sun Buggy Desert Racer at the Vegas Dunes Off Road Recreation Area! Amargosa Means 'Big Dune' and they are so steep and so tall that you're not likely to get to the top of many of the larger dunes here, but we know you'll have fun trying. This is a premium VIP experience Free Roaming Off Road Tour is best suited for repeat visitors who've had the benefit of training on our other Off Road Adventure Tours. SunBuggy WAY MORE FUN Fun Rentals Famous Team building event for groups small to Large can provide more seat time (behind the wheel where the pedals are!) for your larger groups than any other driving experience vendor! 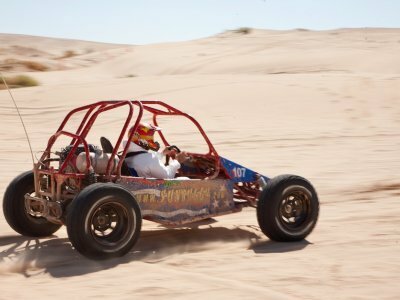 Sun Buggy is the ultimate wild bachelor party adventure! The Vegas Mini Baja Chase is so insane it'll make you WANT to settle down and get married! Don't wuss out on a regular off road tour, these are the last days of manly greatness! For an amazing Las Vegas Bachelor party weekend YOU MUST ENGAGE IN THE CHASE! THE MOST AMAZING LAS VEGAS CORPORATE EVENTS! 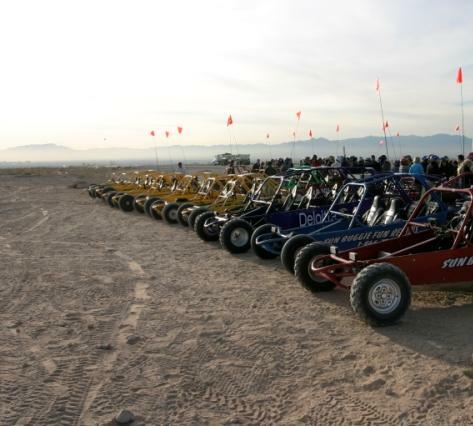 Ultimate Corporate Team Building and Incentive Events at Sun Buggy Fun Rentals in Las Vegas Nevada and Pismo Beach California, Have dealer client teams, team building, east versus west, red versus blue, Sun Buggy has done it all and will make your event a memorable one! 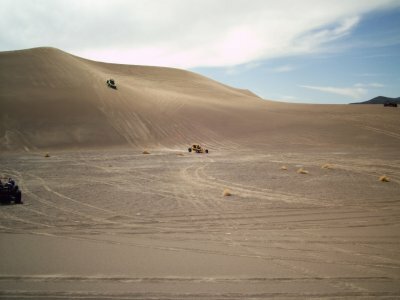 A Sun Buggy Desert Adventure creates a unique memory that will last a lifetime, there's no mistaking this for what you did on your last vacation. 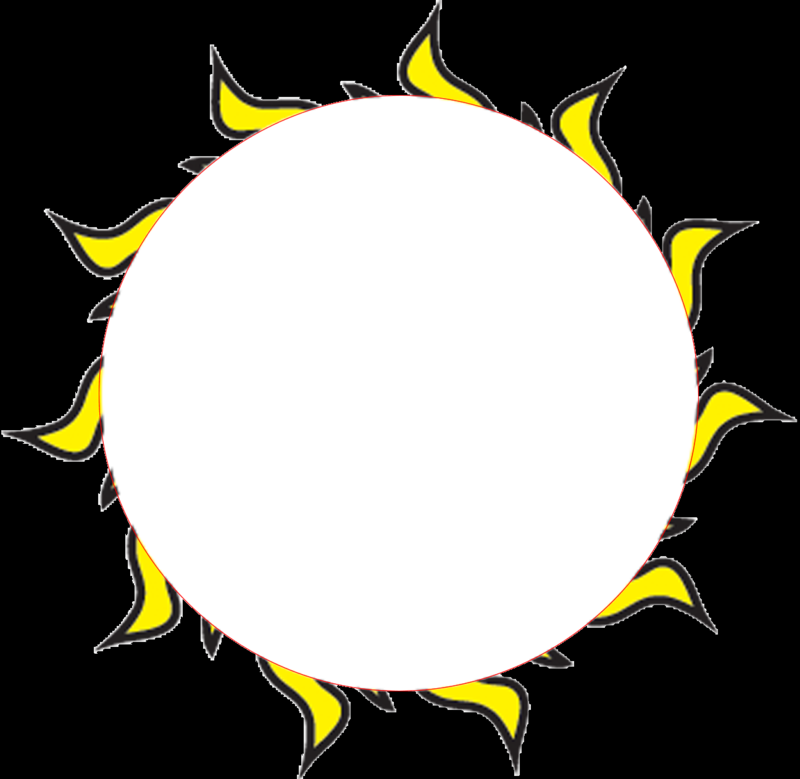 Great for ages 4 to 104, and groups up of up to 500 people!